We call it an extended stay hotel for a reason. You may never want to leave. Get Comfortable. Stretch out with separate living and workspaces that provide guests with plenty of elbow room and kitchens with refrigerators you can raid. Because life away from home is still, well, life. 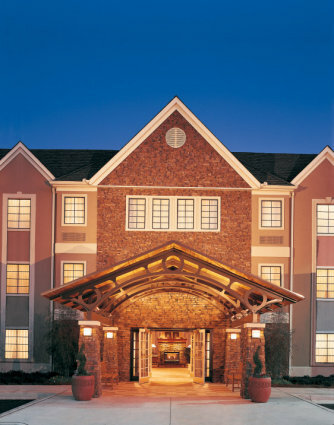 Live it better at Staybridge Suites Wichita. Located 1 block south of K-96 at the Greenwich Rd Exit. Across from Target Supercenter, New World Market, casual eateries, and variety shopping. Fresh, hot complimentary breakfast buffet or breakfast "On The Go!" PRIORITY CLUB® REWARDS - Guests earn Priority Club® Rewards points on every qualifying stay. Points can be redeemed for free nights, miles and more. On-site meeting rooms ideal for small groups up to 18 people. We have a classroom size that seats 12 people, a u-shape for 10 people, and a theatre for up to 18 people. Our on-site meeting rooms are equipped with high speed internet and AV equipment complimentary when you reserve your space. We also have catering available for your meetings. We also have a business center computers and printers for all your business needs. Earn 3 points for very $1.00 spent on qualified meetings with your priority club rewards card. Special rates and accomodations for your guest. Call today for pricing and availability. Coming to Wichita for an Event? There are several special events and conventions coming to Wichita including: Kansas State Highschools 5A and 6A state wrestling tournaments, National Junior College Althetic Association Region 6 basketball tournament, Park City/Wichita wrestling classic championship, MidAmerica Youth basketball hall, Kansas Nursing Research Exchange, National Junior College Association Refion 6 baseball championship, PGA Preferred Health Systems Wichita Open, Automobilia's Midnight Carshow and street party, Bikes United Motorcyle Entertainment Custom bike and stunt show, National Baseball Congress World Series, Mid America Youth Basketball Boys National Tournament, Kansas Junios Live Stock Show and Sale, Wichita Industrial Trade Show, and Kansas Music Educators Association Inservice Workshop. We want to be your hotel of choice. Call today to book your room and for rates.